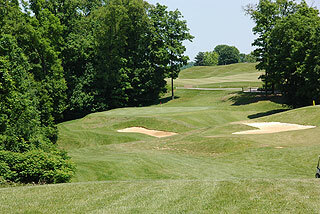 Sultans Run Golf Club, located about 45 minutes from French Lick in Jasper Indiana, is a 4-1/2 star (Golf Digest) gem that was originally designed in 1992 and enhanced with finishing touches in 1996 by architect Tim Liddy. Built over 224 extremely rolling and wooded acres, this gorgeous layout features abundant sand bunkering (72 in total) with 11 holes having water in play in some shape or form. 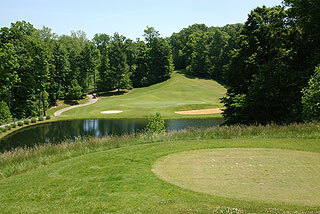 Most golfers will remember Sultans Run for its finishing hole - a dogleg right par four that plays to a green complex featuring waterfalls in back with a pond short right. On our summer visit in 2009 we found the course to be in wonderful condition, with fine rolling bent grass putting surfaces at the end of zoysia fairways - that are easy to play despite the dormant look that is present for all of the winter and most of April. 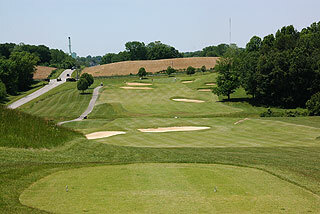 Many courses in this part of the country feature bermuda fairways that are brown in color until the warm weather sets in. The clubhouse at Sultans Run is of modern design with a pro shop plus restaurant/lounge that serves sandwiches, beverages and snacks. 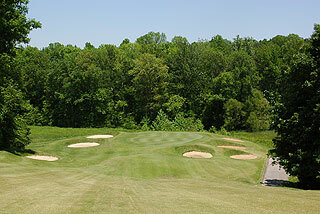 A grass range and putting green are located near this facility, and a short game area with practice bunker is present near the 8th tee. 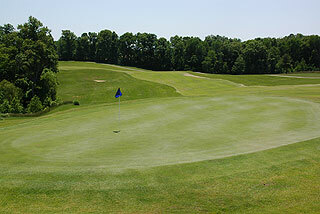 On course, yardages are provided along the cart paths with markings every 50 yards at 75, 125, 175 and 225 yards away. Red, white and blue stakes are posted in the fairways at 150 and 200 yards, and pin placement sheets indicate front, middle and back hole locations. Four sets of tees play to distances/slopes measuring 6859 yards/136, 6429 yards/138, 5842 yards/122 and 4911 yards with a slope of 129 for the ladies. As the slope ratings indicate - this is a good test of golf. The main challenge is present in the fairway and greenside mounding and swales that can make recoveries and up and downs a difficult task. Golfers will have a fair share of lies playing sideways or below/above the feet - while trying to accurately approach putting complexes that include moguls and collection areas. A full spectrum of shots will be necessary to recover from offline approaches. You can get some indication of the difficulty from the above photos. While we found the course to be beautiful. 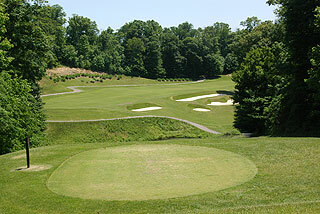 The par threes are exceptional both aesthetically and in design. At just $46 weekdays and $54 weekends including cart during prime season, we highly recommend Sultans Run as a wonderful value. This is a world class facility - that can be enjoyed without breaking the pocket book. 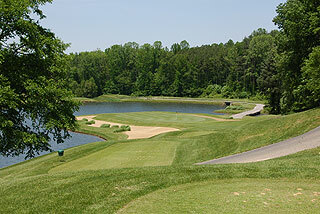 The property can host up to 200 players for golf outings, and stay and play packages are available at least 5 area hotels. 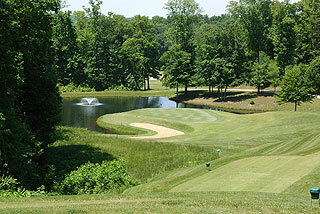 Sultans Run hosted the Senior Amateur Qualifier in 1997, the NGA Hooters Tour in 1998, and has been recognized as one of the Top 100 Women Friendly Courses (Golf For Women 1995-98). For more info, visit our page for the course, with direct link to their website by clicking here.